“Season of Giving” for the Poudre Heritage Alliance – Donate today! There are so many ways to get involved with the Cache la Poudre River National Heritage Area, including #GivingTuesday, Colorado Gives Day, Dinner at HuHot Mongolian Grill, and the Poudre Pour. Thanks for supporting the Poudre Heritage Alliance! 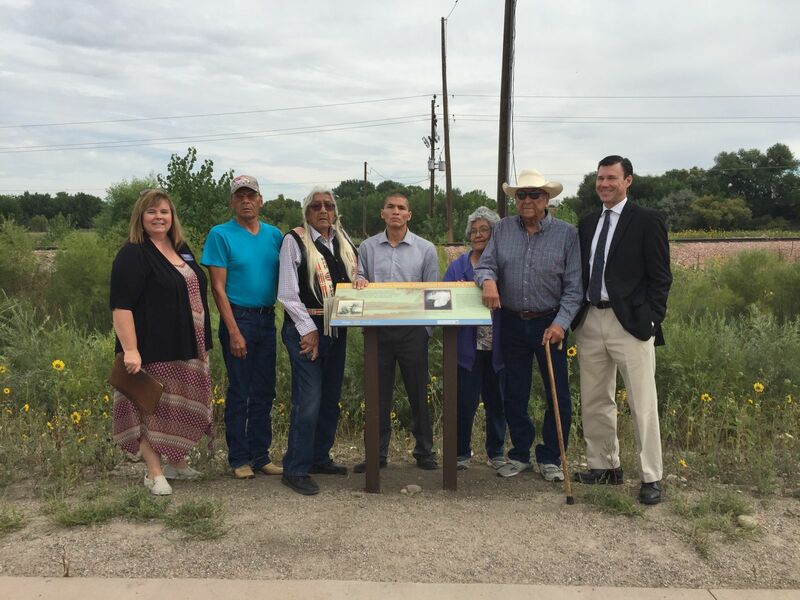 The Poudre Heritage Alliance Joins the Global #GivingTuesday Movement! The Poudre Heritage Alliance for the Cache la Poudre River National Heritage Area has joined #GivingTuesday, a global day of giving that harnesses the collective power of individuals, communities and organizations to encourage philanthropy and to celebrate generosity worldwide. Occurring this year on November 28, #GivingTuesday is held annually on the Tuesday after Thanksgiving (in the US) and the widely recognized shopping events Black Friday and Cyber Monday to kick off the holiday giving season and inspire people to collaborate in improving their local communities and to give back in impactful ways to the charities and causes they support. On Giving Tuesday beginning at 6:00am MST, Facebook will be waiving all fees for donations made through Facebook , and the Bill and Melinda Gates Foundation will match up to $2M in donations. The stakes for PHA and the CALA are high. The PHA and CALA are under threat from increasing demands on water, shrinking federal appropriations, the need to raise awareness about water management, rising human health and safety concerns, a generation more connected to their technology than to the natural world, and the loss of history and heritage over time. Those who are interested in joining Poudre Heritage Alliance’s #GivingTuesday initiative can visit Cache la Poudre River National Heritage Area’s Facebook page to donate or set up their own fundraiser for #GivingTuesday! Click here to donate today! 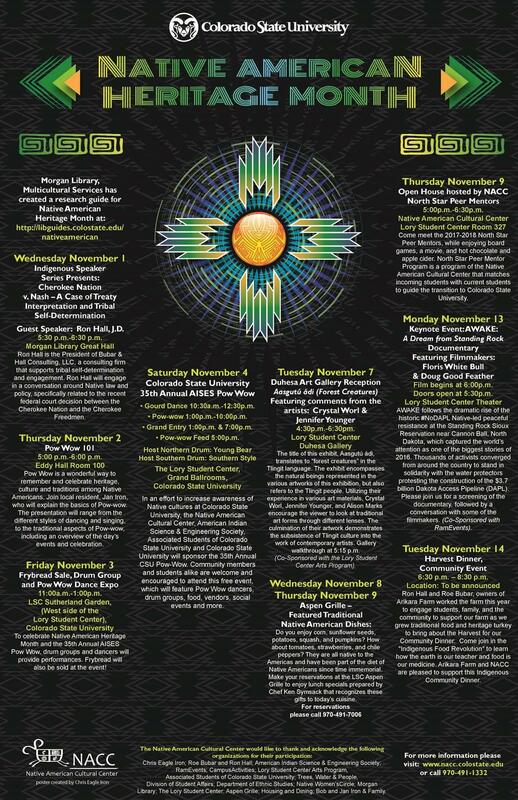 November is Native American Month, and there will be a variety of events taking place on CSU’s campus hosted by the Native American Cultural Center and many other organizations. Guest Speaker: Ron Hall, 5:30 p.m. to 6:30 p.m. at the Morgan Library Great Hall. Ron Hall is the president of Bubar & Hall Consulting, LLC, a consulting firm that supports tribal self-determination and engagement. Hall will engage in a conversation around Native law and policy, specifically related to the recent federal court decision between the Cherokee Nation and the Cherokee Freedmen. Pow Wow 101, 5:30 p.m. to 6:00 p.m. in Eddy Hall room 100. Pow Wow is a wonderful way to remember and celebrate heritage, culture and traditions among Native Americans. Join local resident Jan Iron, who will explain the basics of Pow Wow, including an overview of the day’s events and celebration. Fry Bread Sale, Drum Group and Pow Wow Dance Expo, 11 a.m. to 1 p.m. at the LSC Sutherland Garden, (west side of the Lory Student Center), Colorado State University. 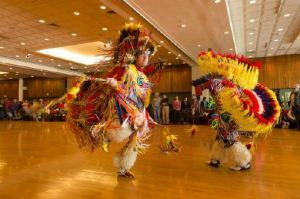 To celebrate Native American Heritage Month and the 35th Annual AISES Pow Wow, drum groups and dancers will provide performances. Fry bread will also be sold at this event. 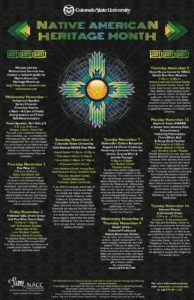 Colorado State University’s 35th Annual AISES Pow Wow. Gourd Dance — 10:30 a.m. to 12:30 p.m.
Pow Wow 1 p.m. to 10 p.m.
Grand Entry 1 p.m. and 7 p.m.
Pow Wow Feed 5 p.m. Host Northern Drum: Young Bear; Host Southern Drum: Southern Style. Lory Student Center Grand Ballrooms at CSU. In an effort to increase awareness of Native cultures at CSU, the Native American Cultural Center, American Indian Science and Engineering Society, Associated Students of Colorado State University and Colorado State University will sponsor the 35th Annual CSU Pow Wow. Community members and student alike are welcome and encouraged to attend this free event, which will feature Pow Wow dancers, drum groups, food, vendors, social events and more. Duhesa Art Gallery Reception, Aasgutú ádi (Forest Creatures). Featuring comments from the artists Crystal Worl and Jennifer Younger. 4:30 p.m. to 6:30 p.m. in the Lory Student Center Duhesa Gallery. The title of this exhibit is in the Tlingit language. The exhibit encompasses the natural beings represented in the various artworks of this exhibition, but also refers to the Tlingit people. Utilizing their experience in various art materials, Crystal Worl, Jennifer Youner and Alison Marks encourage the viewer to look at traditional art forms through different lenses. The culmination of their artwork demonstrates the subsistence on Tlingit culture into the work of contemporary artists. Gallery walkthrough at 5:15 p.m.
Aspen Grille – Featured Traditional Native American Dishes. Do you enjoy corn, sunflower seeds, potatoes, squash and pumpkins? How about tomatoes, strawberries and chile peppers? They are all native to the Americas and have been part of the diet of Native Americans since time immemorial. Make your reservations at the LSC Aspen Grille to enjoy lunch specials prepared by Chef Ken Sysmsack that recognize these gifts to today’s cuisine. Come meet the 2017-2018 North Star Peer Mentors while enjoying board games, a movie, and hot chocolate and apple cider. North Start Peer Mentor Program is a program of the Native American Cultural Center that matches incoming students with current students to guide the transitions to Colorado State University. Film begins at 6 p.m. Doors open at 5:30 p.m. Lory Student Center Theatre. AWAKE follows the dramatic rise of the historic #NoDAPL Native-led peaceful resistance at the Standing Rock Sioux Reservation near Cannon Ball, North Dakota. Thousands of activists converged from around the country to stand in solidarity with the water protectors protesting the construction of the $3.7 billion Dakota Access Pipeline. There will be a screening of the documentary, followed by a conversation with some filmmakers. Ron Hall and Roe Bubar, owners of Arikara Farm, worked the farm this year to engage students, family and the community to support our farm as we grew traditional food and heritage turkey to bring about the harvest for our Community Dinner. Come join in the “Indigenous Food Revolution” to learn how the earth is our teacher and food is our medicine. Arikara Farm and NACC are pleased to support this Indigenous Community Dinner. For more information please visit www.nacc.colostate.edu or call 970-491-1332. See the link to the original article here.